Iggy has been my test pony for all sorts of theories I’ve accumulated over the years we’ve competed and the horses we’ve brought along. How it is easier to start a horse who is mature and has all of his connective tissues and bone fully ‘cooked.’ How it is not distance that ruins horses getting fit or competing; it is speed. How horses retain their fitness better than humans. How critical the brain is in an endurance prospect. How training is a more important focus than conditioning. We’ve had Iggy since late March, and we’ve been making steady progress using all of the above philosophies. Since he appeared pretty unfit when he came home with us, we just did baby rides around the trails here at home. Hills are always a part of our workout since we live at the top of a big one, but it was all about learning to use himself, getting persuaded that yes, he really did have to work for a living, and no, the dogs who accompanied us were not an excuse for hijinks. He got stronger, fitter, and honestly, all of that went seamlessly — no filled legs, no sore backs, no attitude issues (other than the dubious work ethic — which I empathized with — I’m not sure I’d want to start working after a three year vacation either), and a generally increasing capacity and enthusiasm for the work. Iggy attended his first competition in Ontario, Canada, at Coates Creek, a 30 mile “set speed” ride, sort of OCTRA’s hybrid version of a LD ride crossed with a CTR. AERC vetting but an ‘optimum’ time window like CTR. 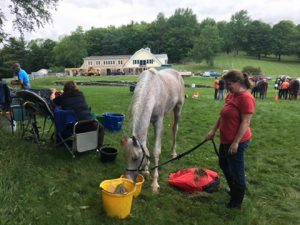 I had little concern for the competition or rules; I wanted to see how Iggy would perform in a competitive setting — hauling, camping, vetting, starting, recovering. My friend Rachel rode our guy Sarge purely as chaperone. This is probably as close as I’ll come to a diva, but Sarge was there to get us around. Rachel was there to do whatever was needed if things went pear-shaped. Luckily for us, it was all pretty uneventful in the most stellar way. Iggy ate, drank, vetted, traveled along, passed, got passed, walked, trotted and cantered his way around the course.